Provenance / Collectors' marks: Collection of George W. Davison (purchased before 1928). The image depicts Jan Asselyn (1610–1652), a landscape painter. 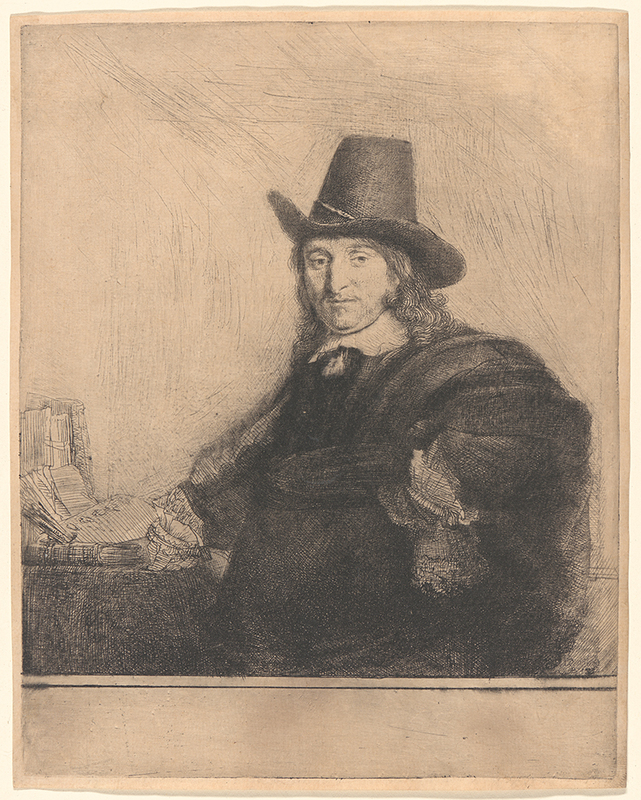 His brother-in-law was a pupil of Rembrandt’s. He was small in stature and had a deformed hand, the origin of his nickname “Little Crab” (possibly from White and Boon). Bibliography: Bartsch 277; H. 227; White and Boon second of three states; per White and Boon (p. 134), an easel originally behind the sitter was removed, possibly to emphasize his stature; Robert Fucci, Rembrandt’s Changing Impressions (New York: The Miriam and Ira D. Wallach Art Gallery, Columbia University, 2015), cat. no. 6.2, reproduced p. 71, see also p. 67. Jan Asselijn, Painter (Krabbetje), . Etching, drypoint, and engraving on heavyweight Japan paper. Second of seven states. Plate: 214 x 169 mm (8.4 x 6.7 in.). Sheet: 218 x 174 mm (8.6 x 6.9 in.). DAC accession number 1947.D1.210. Gift of George W. Davison (B.A. Wesleyan 1892), 1947. Open Access Image from the Davison Art Center, Wesleyan University (photo: R. Lee). http://dac-collection.wesleyan.edu/obj12031 is a persistent link to this page with no user-session information.